WINTER GARDEN, Fla. -- The trick to luring players to your Orlando-area golf course is to get them away from the resorts and amusement parks and into their cars and driving. Once you've done that -- no small task considering how many people business and vacation there -- you've got to make them happy about it, also no small task. Deserving of its name, Orange County National's Crooked Cat golf course is long and winding. If you're visiting Orlando, or even if you live there, you've got to have a reason to get in your car and drive into the rural areas. 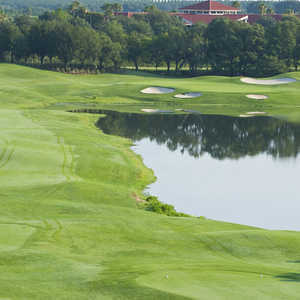 There are plenty of golf options within or just outside Orlando, many of them literally just outside the resort's door. Yet driving away from the commotion of Orlando often will pay dividends, especially if the destination is Orange County National, a hefty 45-hole uber-golf complex in western Orange County near Winter Garden. Roughly 30 minutes from downtown and even closer to Disney World's north entrance, the facility quietly sits amid unencumbered farmland and citrus groves. The amenities include two of the best regulation 18-hole courses in the region in Panther Lake and Crooked Cat, a nine-hole short course called Tooth, a sprawling 360-degree driving range and learning center, a putting course, and a 50-room lodge. At over 900 acres, most of it idle and empty of development, there's plenty of room for it to grow if and when Orlando decides to creep out to it. The drive to OCN through the rolling agrarian landscape doubles as transcendent preparation for the very un-Florida-like Panther Lake experience as there's definitely a "we're not in Orlando anymore" feeling to the excursion. Credit for the atypical nature of the course must go foremost to the property's setting and topography, says Orlando-based architect David Harman, who designed the courses. "It (the land) had a natural mixture of these rolling meadows and grasslands, then a whole series of existing wetlands, and then a couple of good sized lakes," Harman says. "Incorporate that into some flat holes that were laying there with the rolling terrain, so you had four or five different mixes within the same property." The diversity of its holes is Panther Lake's great attribute. There's something of everything here, from flattish open-air holes scrawled with bunkers to the central wetland section to the sloping and elevated holes bordering a pine forest and citrus groves at the extreme south side of the property. 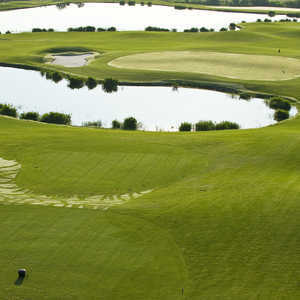 At 7,295 championship yards and frequent host to PGA Tour Qualifying School, this is not a meek golf course. Most of the greens are elevated with formidable internal contours surrounded by sweeping, variously shaped bunkers. And like its ever-changing topography there are near schizophrenic character changes between the two nines. Holes two through seven, playing primarily through the lower wetland areas, are more strategic in nature and call for thoughtful shot-making. The downhill 515-yard second hole is reachable in two if the player wants to flirt with the small pond fronting the green's left. The dogleg left par-4 fifth, 405 yards from the tips, demands a well-placed drive down the left half of a cresting fairway followed by an even more delicate approach into a deep narrow green abutted tightly by a hazard on the right. Seven is a heroic double-breaking par-5 cut through twice by wetlands. Side two features pronounced elevation changes and is more about power with four staunchly uphill approaches. To his credit Harman stitched the holes together with seamless rhythm and tempo. "Panther Lake is very unusual for a Florida golf course. I wanted it to be everything it could be," he says. 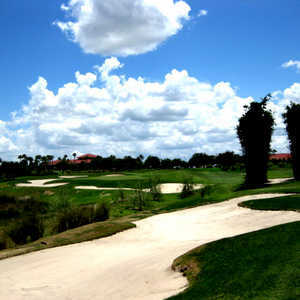 "There are plenty of plain golf courses in the state of Florida. I wanted to take a beautiful piece of land and shape it into as good a golf course as we possibly could." Located across a small road north of Panther Lake, Crooked Cat is a different breed altogether. The different topography of the adjacent site suggests an alternative style of design. It's not flat (in fact the second nine at Crooked Cat is extreme in places), just different. "It still has roll," Harman says, "but the rolls are much longer. The hills at Panther Lake are more abrupt. The ones at Crooked are long, flowing masses." Heading outward Crooked Cat rumbles and tumbles through the decidedly prairie-like landscape, beckoning the player to keep the ball close to the ground. At Panther Lake an approach shot can only realistically be rolled onto the green on four or five holes. At Crooked Cat there are only four or five holes that you can't. Another notable difference is the bunkering. Panther Lake's bunkers frequently "sweep up" toward the greens, as Harman says; Crooked Cat's scattered bunkers are cut down into the earth and are highly irregular to affect a more random and naturalistic look. It may not be as composed but it provides Crooked Cat its raucous personality. In contrast to Panther Lake, which plays better when it's finely conditioned and lush, Crooked Cat is best fast and firm. It's susceptible to the wind because of its orientation on higher ground, resulting in exciting, creative golf if conditions are optimum. "There's opportunity for the ball to roll a lot father on Crooked Cat than at Panther Lake," Harman notes. "You can just about hit it as far as you want straightaway." That doesn't mean the course is a pushover. The pros play it at 7,277 yards. Nos. 10, 11, and 12 are consecutive par-4s of 459, 446, and 461 yards respectively. That said, hole-to-hole there's shotmaking intrigue for a wider array of players than at Panther Lake. No two holes at Crooked Cat exemplify the architecture of the course better than the first and the last. The par-5 starter is a bumpy 503-yard ride over a fairway ringed with tall prairie grasses and marked intermittently down the right with bunkers as it bends gradually left toward a green that's basically an extension of the fairway. The 18th is crafted in similar vein, a 458-yard par-4 across a massive, rippled fairway where only the wildest of tee shots will err into the grasses left or right. Dotting the hole's left perimeter are numerous, staggered grassy dimples, shallow depressions in the earth reminiscent of the original bunkering on links courses where sheep and wildlife sought refuge from the wind.